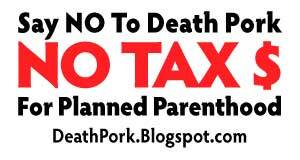 The Say No to Death Pork flash campaign to defund Planned Parenthood will announce our Founding Activists tomorrow. Sunday will be the first day of the Week Long Flash. Please spread the word, even now! Feel free to download and use this image file.